Once a year, I head into the backwoods outside of Anchorage and spend a week or so at a public-use cabin by a lake to unplug and clear my head of the necessary evils of urban living. There’s no running water, no electricity, no internet. It’s delightful, but it takes some planning to keep my iPhone charged up in case of emergency. I can’t wait to take this rugged, high-capacity, waterproof backup battery with me this year, as it’s the perfect companion for a modern outdoor adventure. The Scoche GoBatt 12000 is a solid little brick of power with 12,000 mAh of juice — enough to keep my iPhone 6 Plus full of energy for four charges, or an iPhone 6 ready to go with up to six charges. It’s got an IP68 waterproof and dustproof rating, which means it can be immersed in water up to three meters and rest-assured it’s dust-tight, something my trips to a cabin in the woods of Alaska provide plenty of. It manages both due to the watertight door that covers the USB charging ports — two to use for charging your iPhone or any other USB-powered device and one micro-port to charge the GoBat 12000 itself. The tiny power brick is rugged, for sure, with Scoche claiming compliance with Military Spec 810G, and I’ve tossed it around during my testing to good effect. The rugged exterior is made of high-impact black plastic that’s only gotten a few scuffs after tossing it off my roof. There’s a great metal alloy clip at the top, as well, that lets me clip the thing via the included carabiner to my backpack when I need to keep it close at hand, as well. 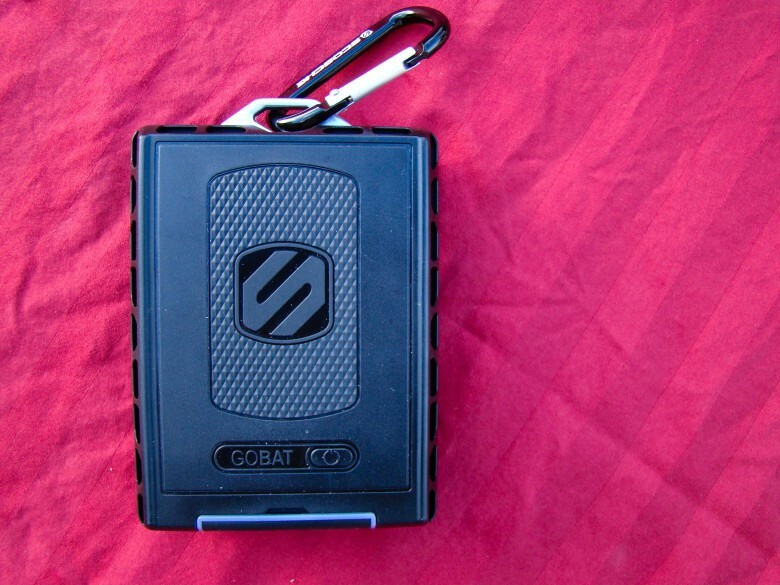 Charging up the GoBat is a cinch, and it’s got an LED light near the charging port that lets you know when the internal battery is charged in quarter increments. It’s even got the ability, when used with a high-speed wall charger, to charge up fully in a paltry five hours, something I’ll appreciate when getting ready for my trip. All in all, the Scoche GoBat 12000 Rugged Portable Backup Battery is the perfect little device to take with you whether you go off-grid or off-script to a new coffee shop. With 12,000 mAh of power, you’ll never be without juice for your iPhone or other USB-charging accessory like the Bluetooth speaker I might take with me to the lake this year. Drop it in the lake or drag it through the dirt, the GoBat 12000 will be ready to keep you powered up and ready to rock. Scoche provided Cult of Mac with a review unit for this article. Learn about more lust-worthy products.